1st Edition. Updated December 2018. If you view an empty Cart, use Browser Return Button to return to website. The night sky, its constellations and Fixed Stars form the basis for the practice of astrology, and many of these stars have much folklore surrounding them and also figure in biblical and mythology stories and folklore. Most of the ancient civilizations, through priests and mystics have studied the night sky, in order to seek its secrets. The civilizations of Babylon, Greece, Phoenicia, Egypt, China, and India have all formulated astrological practices based on their records, of observations and accurate measurements of the sky and stars. Fixed Stars are unique in some respects as the ancients identified, from observations, and concluded that they do not seem to move in relation to the other stars in the night sky, and classed them as fixed. Naturally we know that all celestial objects are moving, in the case of Fixed Stars this movement is just extremely slow and measure. This work therefore concentrates on the aspects of certain Fixed Stars, which are of the greatest importance to the student or practitioner, for these stars often bring great benefits in unexpected ways, depending upon the zodiacal positions of your Sun and Moon at the time of your birth. Little is taught about Fixed Stars, because those who do know about them have realized that the beneficial Fixed Stars do not help everybody, and they have been unable to determine why. Beyond that, they only bring their greatest blessings to those who open their minds so the Fixed Stars Spirits power is directed through the Archangels, who work through the planets. 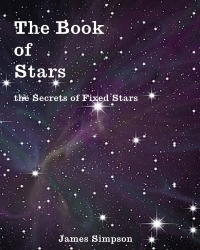 Chapters cover, Behenian Fixed Stars, Angelic Fixed Stars and their properties, the creation of Fixed Star Talismans and the performance an timing of the Fixed Star Rituals. So this book is unique in many ways as it details the Magick of the Fixed Stars, not the Astrological aspects only. There are three different rituals that may be performed when invoking the Fixed Stars. The first is a simple meditative ritual which is presided over by your Sun or Moon and Fixed Star Archangel(s) and may be used when a situation cannot wait for the correct astrological alignment. The second, although also presided over by your Archangel, is the traditional method used for creating and consecrating your Fixed Star talisman, during the correct astrological alignments, and finally the third ritual is for non-Behenian Fixed Stars. To purchase this eBook use the PayPal link in the left-hand column. Gabriel, Raphael, Chamuel, Michael, Adabiel, Haniel, Zaphiel, Uriel, Raquel, Zerachiel, Metatron, Remiel, Barachiel Seatiel, Jehudiel, Simiel, Orifiel, Mikael, Shatqiel, Baradiel, Shachaquiel, Barqiel, Sidriel, Jophiel, Zadkiel, Kafziel, Samael, Adabiel, Zaphiel, Metatron, Tutrusiai, Israel, Uzziel, Azariel, Raziel, Lumiel, Lucifer, Cassiel, Sachiel, Anael. Books on Occultism, Magic, Sorcery, New Age Thought, Ceremonial Magic, Kabbala, the Supernatural, Spells. The purpose of this site is to give general information and eductional purposes only to the reader on the products and books offered by Archan Publishing. A&A, Archan Publishing or any directly, or indirectly affiliated entity disclaim any liability to any person, arising directly, or indirectly from the use of or from any errors or omissions in the information within these page and their links. The adoption and the application of any information is at the discretion of the reader, and is their sole responsibility. All the information on the public areas of this site is believed to be from the public domain or copyright of Archan Publishing.